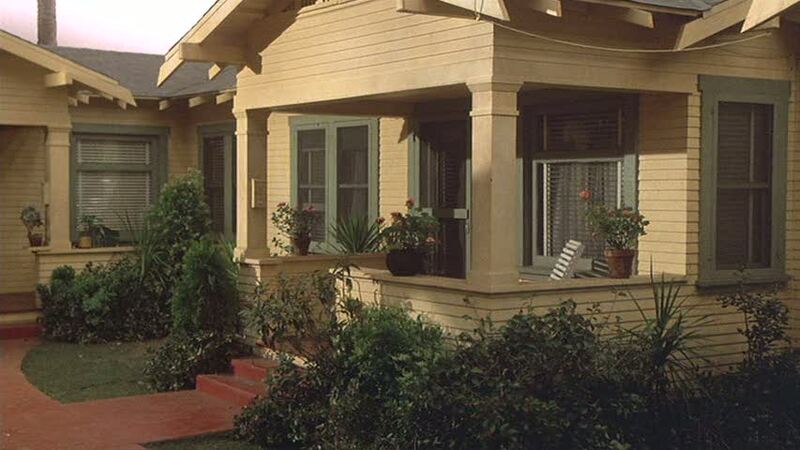 Goldie Hawn's 1940s Bungalow in "Swing Shift"
One of the questions I get asked a lot is whether the bungalow court from the movie Swing Shift is the same as the one from Alvin & the Chipmunks. I wasn’t sure, so I started researching it. I couldn’t find much information online about it, so I rented Swing Shift to see for myself. My conclusion? They’re not the same. 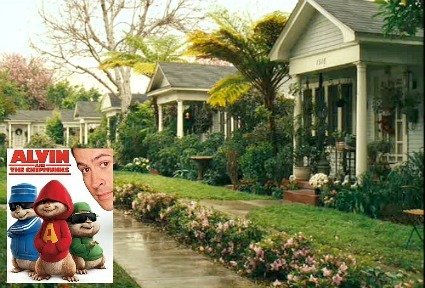 The bungalow court in Alvin & the Chipmunks was a little larger, with more houses and more space between them. The housing complex in “Alvin” is known as St. Andrews Bungalow Court, and it was built in 1919, 10 years earlier than these. This is the kind of movie you watch more for the scenery–the sets and the 1940s fashions–than for the plot. I also enjoy the actors in it–especially Goldie Hawn and Christine Lahti’s characters, who strike up an unlikely friendship while working the swing shift. 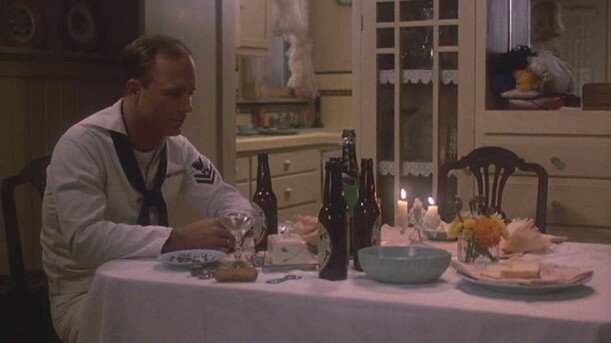 Jack returns home from the war to discover that his wife has been cheating on him with her boss from work (Kurt Russell). Here she is with Lucky, who came home with her and borrowed one of her pink robes. 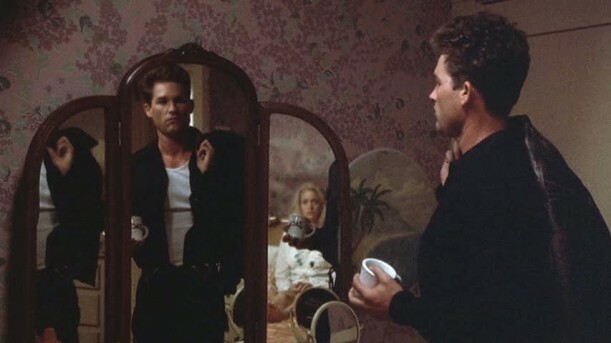 Goldie Hawn and Kurt Russell have been together since making this movie. So sad to think the charming bungalow court is no longer there! Thanks to Gary for the information and photos. 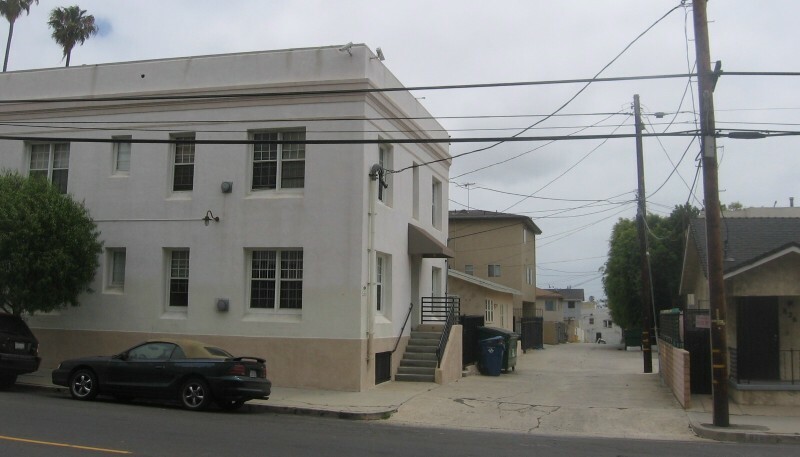 You can see an example of one of the condos that were built on the property in 2007 here. Thanks for this post. What a charming bungalow it is!! Yes, Kate does look very much like her mom. .-= Susan´s last blog ..God Bless America- =-. Cute bungalow. I agree, that does look like Kate Hudson in that shot. I haven’t really seen much movies of Goldie Hawn, but the one I have seen her in that I like, is: “Overboard”. That was another movie she starred in with Kurt Russell. I read Goldie Hawn’s autobiography and she talked a lot about this movie. She said her and the director (Jonathon Demme) were at each others throats and by the time the movie came out she was basically ashamed of what it had turned into because it wasn’t her vision at all. She also got a bad reputation as difficult because of all the fighting with Demme but she would do it all over again of course because of meeting Kurt. Another fun fact about it was her mom Laura Hawn, played Ethel the landlady in the film which meant a lot to Goldie. It’s a pretty good bio! It’s called A Lotus Grows in the Mud. .-= Heidi@recklessbliss´s last blog ..Prize Home Tour =-. omg, just makes me wanna live there! .-= Annie@ A view on design´s last blog ..The Hamptoms – Mona Vale =-. 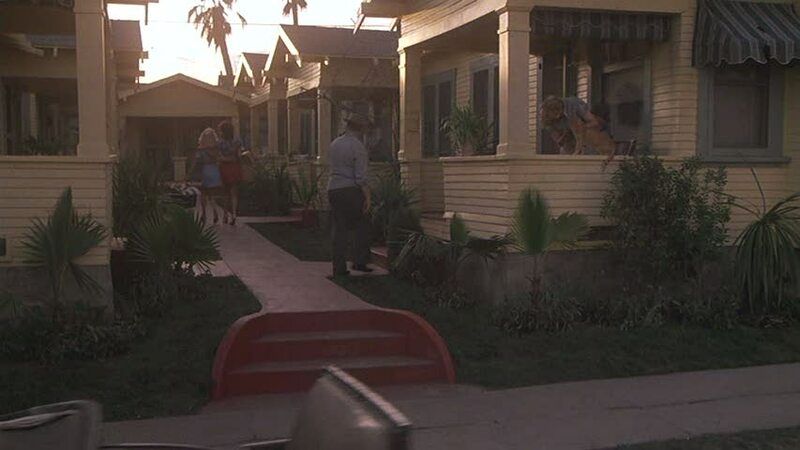 I love those bungalows! I think my favourite Goldie movie would be Overboard. I, too, love the bungalows. They evoke a certain kind of charm that the palatial homes that followed just don’t “do it” for me. I love the detailing from the era Swing Shift portrays and the moodiness and, oh my, these three have help up well over the 25 years or so from then until now. Your posts are such fun and the perfect way to spent a post 4th of July morning! .-= Penny´s last blog ..A Fourth Parade =-. .-= desiree´s last blog ..Homeowner Leaves Town-Eichler Gets New Decor =-. My house is a 1930’s bungalow, only it is brick. 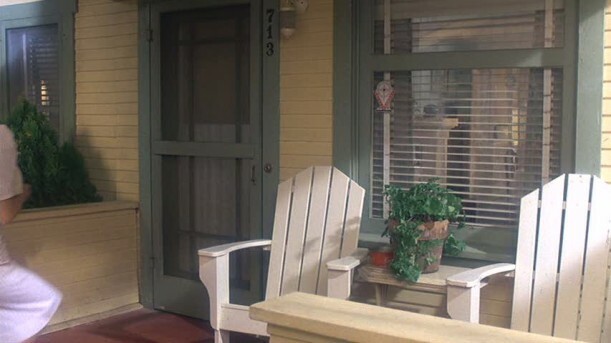 Big front porch like hers…..I love it! .-= Amanda @ Serenity Now´s last blog ..On the 4th =-. those bungalows are lovely. great set of photos, and julie’s front porch is so inviting! .-= ana @ i made it so´s last blog ..how i made a doormat with those straw trivets =-. Love these little bungalows! I just watched Alvin this weekend because of your post about that house and now I want to see Swing Shift again to REALLY look at that one! I think you should get a commission from the movie execs! .-= clustres´s last blog ..Chandies Here- There- Everywhere =-. My favorite would be Overboard, with Housesitter a close second. And yes, Julia, you need to read her bio. It’s funny, heartwarming, and so much like so many of us. We tend to put ‘stars’ on thrones 🙂 forgetting they are just as human as we. What I wouldn’t give to own a bungalow!! We have so few of them in Prattville 🙁 and what we did have was torn down for ‘progress’. Sad. Clanton has quite a few and are so charming, as does Old Cloverdale in Montgomery. Have a great week and love your blog! .-= Nancy Hood´s last blog ..Happy Independence Day- =-. You have to also do the house on Seems Like Old Times, starring Goldie and Chevy Chase. It has the house and a guest apartment above the garage in it. It’s cute too. I have always loved this movie because of the bungalow. I wanted to come back to California and buy a bungalow and I have it picked out in Corona, CA, but it’s occupied and I live in a ranch style. Goldie’s place in this movie is so tiny, probably hard to live in for more than one or two people, but I would love to try! I can get a bungalow in my old hometown of Anderson, Indiana for $5500. Yes, that’s five thousand, five hundred dollars. I love bungalows – the older the better! Some of my favorite Goldie Hawn movies are the ones with Chevy Chase – It seem’s like old times: lovely house very pastelly 80’s! 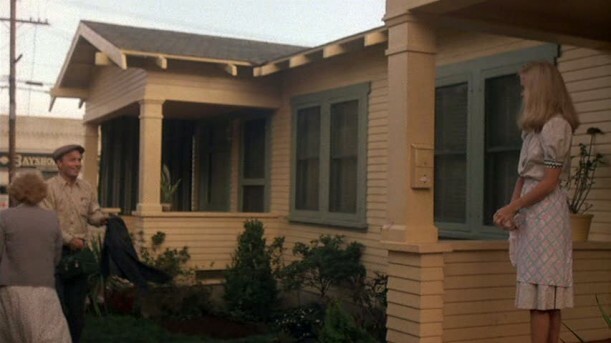 and that great San Francisco apartment from Foul Play. Thanks for making Monday’s fun ! Wow, Kate and Goldie do look almost completely identical…I especially noticed it in the picture of Goldie sitting on Ed Harris’ lap! The only early Goldie Hawn movie I have seen was HouseSitter…but I might have to check this one out! I just love WWII-era movies. .-= Kate (Little Beach Bum)´s last blog ..Beach Twisters- =-. Oh, I enjoyed looking at these pics. I’ve watched this movie a few times to figure out the floor plan. My favorite Goldie movie is Overboard. .-= Rhianna´s last blog ..Jack and Carly tissue please =-. Two house styles close to my heart. Love the bungalows (sigh, look at all of those built-ins) and the courtyard houses (my previous condo had a “California courtyard”) Charming. .-= StuccoHouse´s last blog ..No Limbs Were Lost =-. I’m a little ashamed to say that I love Overboard. Kurt Russell is in that movie too. It’s campy but I love the plot. .-= Jenny at Henrietta’s House´s last blog ..Fried Green Beans- Anyone =-. “Overboard” is one of the most underrated comedies ever made. I think it is just as good as the best screwball comedies from the late 30s. 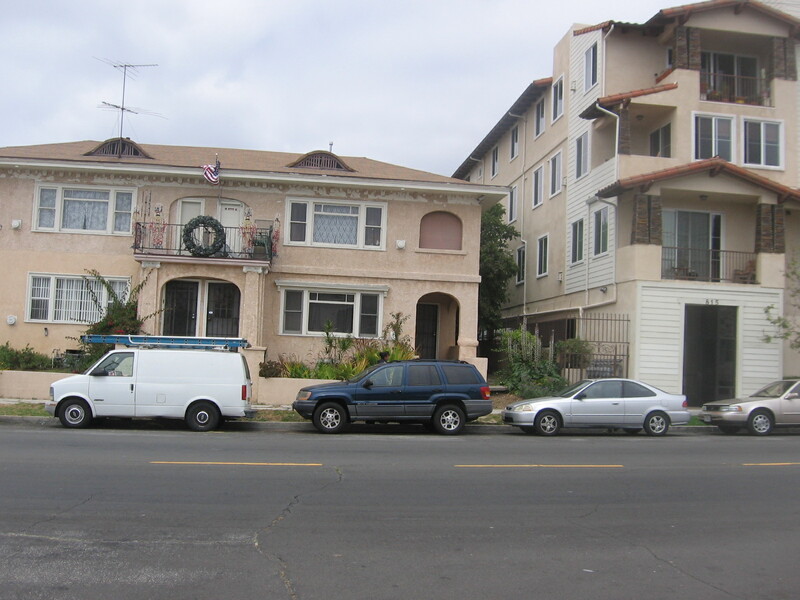 But promise me you will never highlight the house in “Overboard”. 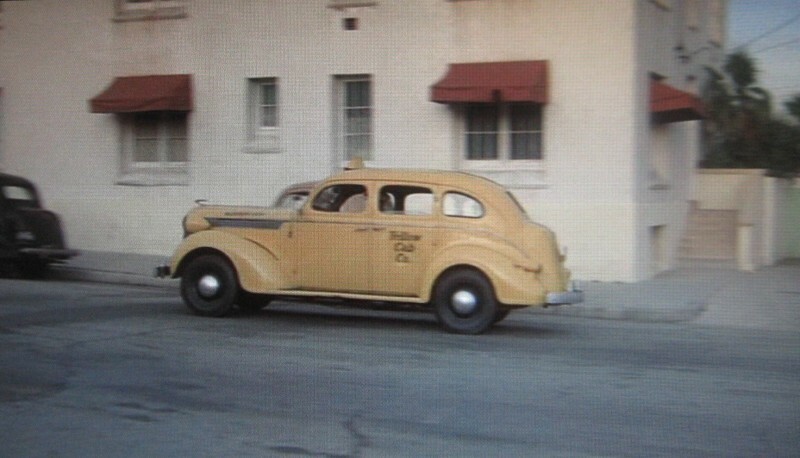 I live in Santa Monica and watched them film portions of “Swing Shift” at sets built on the beach. In fact I snapped a picture of Goldie walking to the set, not looking too happy. https://www.flickr.com/photos/7384797@N02/2273899414/ Later Kurt Russell showed up, though he wasn’t in the scene and a big smile returned to Goldie’s face. 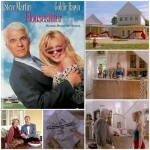 Just found your blog from Vintage Sassy…loved this movie, it’s one of my favorite of Goldie Hawn also Overboard! I just recently found your site and just love it. 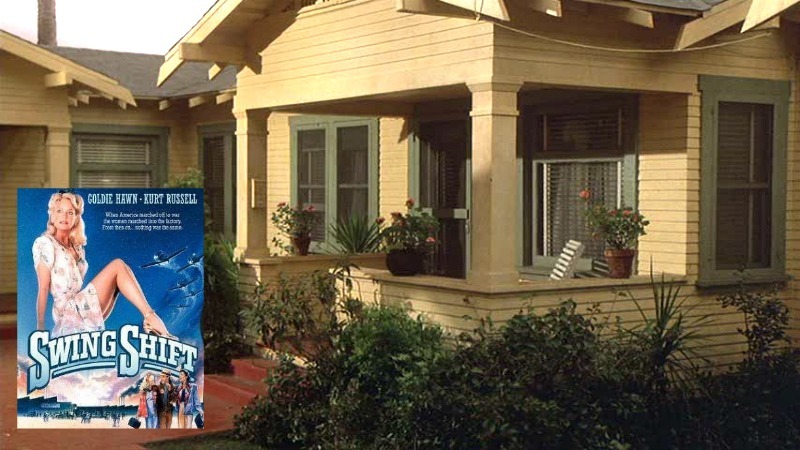 I was jsut watching Alvin & the Chipmunks the other night wit my girls and again was drooling over the quaint little bungalow – I’m going to have to check out your feature on it when I have a little more time. Great to know there’s a site for house addicts like me. It isn’t a house but when I saw this about Goldie Hawn I couldn’t help think about the setting for another of her movies, Crisscross. 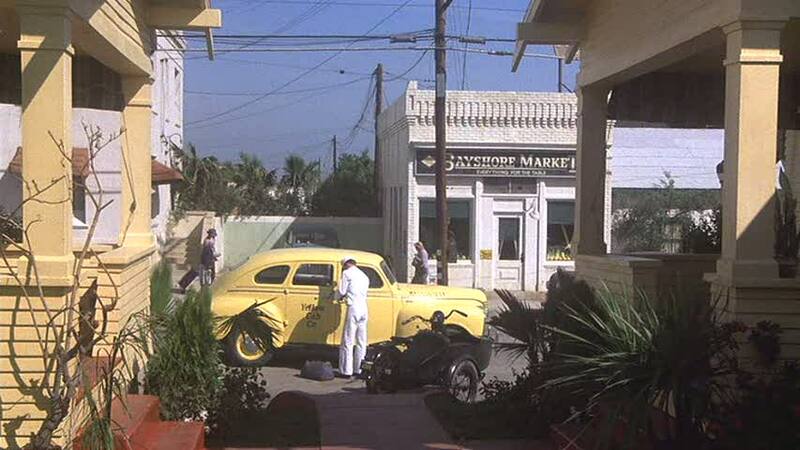 It was filmed in Key West at the Eden House in 1992. We have stayed there many times and it’s favorite of ours because it is so laid back. Nothing like the “seedy hotel” as seen in the trailer. The beautiful staircase in the center of the hotel is still there. They have modernized and added several buildings. Great place to stay while in Key West. You can see their website at Edenhouse.com. It’s named for the owner Mike Eden. He has the poster for the movie hanging in the lobby. I would love to live there. I think the courtyard is a big part of what makes it so charming for me. This is a favorite movie of mine and I adore the bungalow! 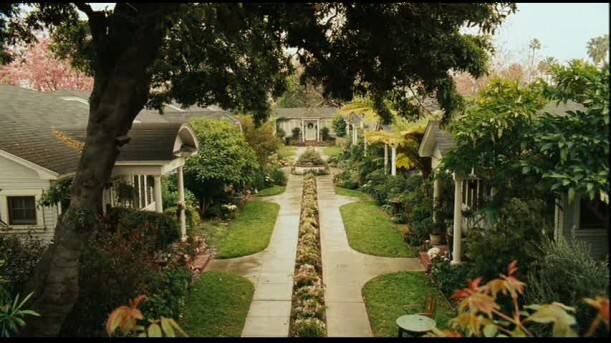 Every time I watch the movie I think it would be so nice to live there. 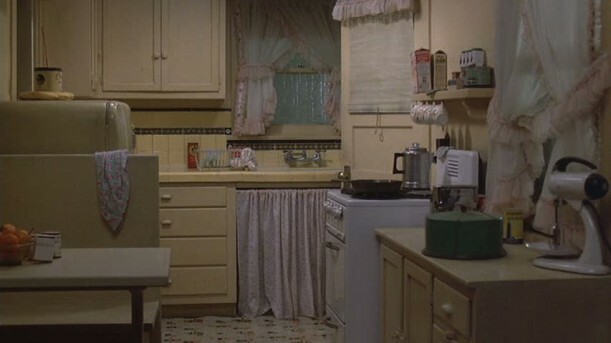 The kitchen really reminds me of my grandparents kitchen in the bungalow they used to live in. .-= Robyn’s Online World´s last blog ..BeFunkycom With Your Photos- Review -amp Giveaway =-. I love bungalows. I’m so glad that they maintained these homes. I’d like to get the movie for the sake of see the interior. Oh this bungalow is right up my alley! We tried very hard to include so many of these types of details in our new house, they have always charmed me. I’d love to see what the interior looks like now, wonder if she kept all of the wall paper. .-= Jessica´s last blog ..Foxglove Family =-. I’m home sick so I decided to check out this movie on Netflix. Thanks for your blog feature! I’ve always loved bungalow courtyards. They’re just so California to me. The movie is a bit better than I expected, but I’m mostly enjoying it due to the costumes and sets. 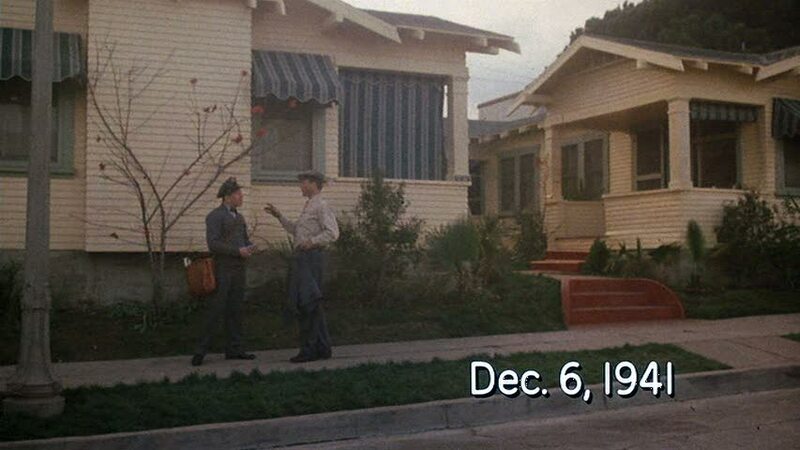 Doesn’t The Day of the Locust (a very different film than Swing Shift) also feature main characters living in a bungalow court? .-= Amy´s last blog ..Unsettling =-. I loved the built-ins that the bungalows had. How could I have missed this post?? And I think I totally missed this movie ever being out there. See, Julia, now this is why your blog is so valuable, because you clue us in to all the fascinating things about houses. Cant wait to take all in all the lovely Forties-ness of this one. OK, I might take a peek at Ed’s “junk” too. Does anyone know the name of the hotel where the characters spent New Years Eve 1944? Going to have to see this movie again ! I also really liked Goldie’s biography. I hope she and Kurt stay together forever. Both so cute.